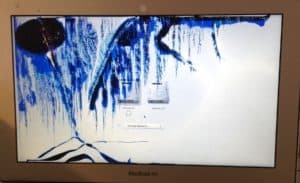 This broken MacBook Air screen looks like a cool piece of modern art with all the blue lines, smears, drips and spots covering most of the display. Sometimes a broken/cracked LCD panel looks like this, and sometimes it is covered with horizontal or vertical lines, or a different color like pink, green, or purple splotches. This model A1466 is a little tricky to fix because of its small size, but we’ve had lots of practice! We specialize in MacBook Air screen repair. We have an industry leading 24 hour turnaround, and competitive pricing. If you have a broken screen on your Mac and are unsure what service you need, please fill out the form below and we will get back to you within a few hours.